Boasting a respected reputation and abundance of local knowledge, Matt Jones has built an enviable sales record in Brisbane’s inner south. With more than 600 sales under his belt with a combined value of more than $250 million dollars, Matt offers all his clients the peace of mind that comes with many years experience. Matt prides himself on taking a meticulous approach to selling, based on thorough research and well-planned strategies tailored to each individual property. Matt brings thorough industry knowledge to every sale strategy, and is regularly approached by industry experts to offer insightful commentary on the local residential markets. Capping off five years as Greenslopes’ number one real estate agent, Matt has also been recognised as a network platinum performer by the prestigious Real Estate Results Network. 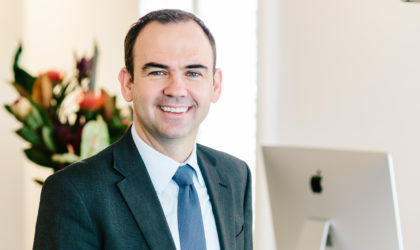 Having been an integral part of the Jeff Jones team for more than a decade, Matt is looking forward to continuing to provide exceptional results for happy clients in Greenslopes and beyond. For almost 40 years we’ve been intrinsically connected to the people, streets and suburbs that make up this beautiful part of Brisbane. Our unrivalled experience and in-depth knowledge in this area means we understand the local market better. And that gives you a distinct selling advantage. Our team comprises highly motivated sales consultants who are dedicated, driven and professional. We always act with integrity, but we’re uncompromising in our aim to secure you the best outcome possible. We’re not part of a national or international chain that calls the shots. Our independence means we’re free to respond to your needs and goals in a way that’s right for you – not a head office in Sydney or Melbourne. Everything we do and everything we don’t do is about achieving a successful result for our clients. We combine our significant expertise, marketing resources, negotiation skills and proven real estate intelligence to consistently deliver impressive sales results. Over time I’ve bought and sold many properties. I would like to commend Matt for customer service which I experienced for the sale of my last property. For me communication is the most important factor when selling real estate, Matt did an exceptional job of keeping me up to date through all stages of the sales process. When searching for an agent Matt’s professionalism stood out amongst the others; Matt delivered on his promises. I highly recommend Matt for any of your Real Estate requirements.. I recently decided to sell my investment property and again decided to appoint Jeff Jones as my sales agent. I found the team to be friendly, professional, and honest in their dealings. I am currently working in Europe but it was no hassle for Matt to be talking to me by phone late in the evening Brisbane time due to the time difference. In my long experience with Jeff Jones I genuinely believe them to be a strongly ethical company who are very good at what they do. Highly recommended. Do yourself a favour and use Jeff Jones Real Estate. They take the hassles and stress out of selling your home. Matt is very professional. It was an extremely seamless process and I was very happy with the result. Prior to placing my property on the market Matt provide options to me concerning how the property could be marketed. This information allowed me to make an informed decision on what was best for me. Great service. In Jeff Jones Real Estate, you’ve found a team who is completely committed to making the entire process easier, more positive and successful – for you. Since 1977, our family business has been passionate about helping our clients through their individual real estate journeys. We continue to celebrate our long-standing local heritage while constantly embracing the latest technology, resources and strategies available. You’ll find us determined, reliable and hard working. You’ll also find us attentive, and personally involved with you every step of the way.